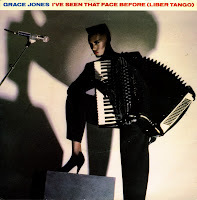 'I've seen that face before' was the third single taken from Grace Jones' 1981 album 'Nightclubbing'. The song combines 'Libertango', an Argentine tango classic written by bandoneonist Ástor Piazzolla, with a reggae arrangement en new lyrics by Grace Joes and Barrey Reynolds. This version of the single, which I've only seen once (when I bought it), features not only a beautiful sleeve, but also a Spanish version on the B-side. It replaces the French spoken verse 'Tu cherches quoi ? À rencontrer la mort ? Tu te prends pour qui ? Toi aussi tu détestes la vie...' with a literal translation in Spanish. The single reached number 2 in the Dutch Top 40. Bizarrely, it did not chart in the UK.